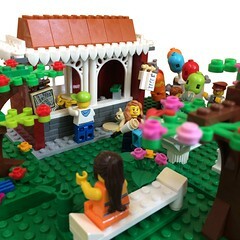 One of the best things about social media sites like Pinterest, Instagram and Flickr is coming across some really special Lego builds. Modern House Redux by Bricksare4me (C.Loch) was one of these builds. Insanely realistic and beautifully photographed, it looked like something straight out of Architectural Digest and I was an immediate fan. 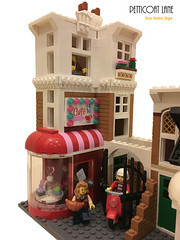 So I was delighted that Bricksare4me was good enough to take some time out and answer some questions about her Lego life and latest project Museum of Superhero and Comic Arts – Mocsa. When did your interest in Lego begin? I played with LEGO bricks when I was little, but back then, sets were very simplistic. In 2012, I rediscovered LEGO with the Monster Fighters Haunted House in a LEGO store. I loved its concept and details; not only was it a house, it was a haunted house that fully closed. It was detailed throughout, on the exterior and interior, and it could stand alone on its own in a display. 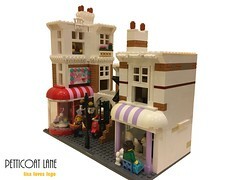 Do you buy a lot of LEGO sets and if so do you have a favourite theme, or do you prefer to build MOC’s? Because I am an artist at heart, and have an interest in Architecture and Design, I prefer to create my own builds. Where did you get the idea for MOSCA? I thought I would blend the concept of miniaturized modern realistic structures or Scale Models used in Architecture, with LEGO Architecture, but also make it interactive. Interaction can be by play, but also by function. In this case, the Museum of Superhero and Comic Arts (MOSCA), can also be used to display elements of LEGO sets. The Museum’s contents is customizable according to one’s own LEGO collection. This is similar to a Museum’s “rotating exhibit” concept, where the contents of an installation are changeable. MOSCA can also be displayed as a building on its own or with other LEGO Creator buildings, and is for kids and adults alike. Were you influenced by an “real” buildings? I do look at “real” buildings of modern design for inspiration, but I prefer not to replicate. I like to build original designs and with the idea that they could actually exist in the real world. As I build, I envision myself inside the structure, and how I would interact and feel within that space. For MOSCA, I was inspired by the Perot Museum of Nature and Science in Dallas, Texas, particularly by its protruding diagonal glass case that houses an escalator. For the purpose of MOSCA, it is a case or cabinet that can be opened and used as a weapons display. Not only does this case’s angularity break up the vertical linearity of the overall building, it also symbolically refers to the iconic superhero that flies into the sky at an angle. How do you build – do you just start with a baseplate and take it from there, or do you design first in LDD or by hand? It can get complicated as I go, but in general, I start with a baseplate and use it to define the size of the structure and its surrounding landscape. I have not used LDD before, and do it all freehand. I do keep a sketchbook, and write down ideas, but nothing is definitive. Like an artist, I like the feel and interaction with the artist’s medium, in this case LEGO bricks, so its all done as I go, enjoying and finding meaning in the creative process. How long did MOSCA take to complete? Building and assembling the Museum’s contents took approximately 3 months, working on and off on it. You’ve included a lot of different features in MOSCA – the curved Atrium wall, the offset Weapons Display Cabinet – what was the most challenging aspect of the build? There were many challenging aspects of this build. I actually had to redesign the building’s base plan twice. However, the most challenging I would have to say was the curved Atrium wall. It was fickle and lining it up and stabilizing it on plates with a knob was difficult. But this wall not only became integral to the Atrium design, but also to the Museum’s concept. It is not only a barrier, but also an exhibit wall for artifacts. It is also in the shape of a question mark (?) to represent the Comic Arts on an esoteric level: the progression of the story arc; the delineation of good vs evil; and the ultimate question, what defines a superhero? and who is a superhero? real or imagined? 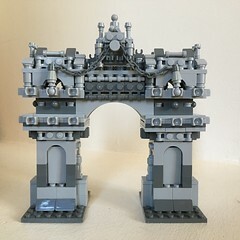 You have a very unique style of photography, which gives your LEGO builds a sense of “realism” – can you share any tips on how best to achieve this look? I regard my photographs as an extension of my MOCs, which I build foremost with realism in mind. I take photos from the same angles as I would a real building, emphasizing unique Architectural details. I take interior shots from the view point as if I was physically standing inside and what I would be looking at.